Article Note: This is the second part of a two part series by Alex Brennan on Seattle 2035 growth alternatives. In this article, Alex discusses what an Alternative 5 should look like. The Urbanist Editorial Board will issue an endorsement on the topic tomorrow that follows in the spirit of Alex’s proposal. On Friday, I penned an article on the history of Seattle’s comprehensive planning efforts and evaluated all four growth alternatives proposed by the City as part of the Seattle 2035 comprehensive plan update. In my estimation, each of the four alternatives presented have significant inequities in them that could be addressed by another alternative. This second articles suggest a fifth alternative that better meets the City’s race and social equity and environmental criteria. To recap a bit, what would an equitable Alternative 5 look like? I expect that many low income communities targeted for new or expanded urban villages in Alternatives 3 and 4 will want to protect their neighborhoods by advocating for Alternative 2, which on the surface looks like it has less displacement impact. However, as I argued in Part 1, Alternative 2 means high housing prices and more urban renewal like growth in the limited areas where growth is allowed. That’s not an equitable strategy. Dispersion is good for equity. Rather than retreating from the expansion of urban village boundaries (as Alternative 2 does), an equitable alternative would further expand the boundaries and spread out growth into more middle class and wealthy neighborhoods. We need more development to keep prices down, but we also need it to happen in less concentrated doses and we need it to be less focused in vulnerable communities where it is replacing our limited stock of low cost housing and can lead to displacement. Putting new urban villages near recent transit investments (as Alternatives 3 and 4 do) is a good thing. More people should be able to enjoy the benefits of those investments. The problem is only putting new urban villages in those locations. On its own, proximity to recent transit investments (light rail and RapidRide) is a flawed framework because it concentrates growth in those most vulnerable communities while preventing low-density wealthy neighborhoods from ever developing the neighborhood centers that can support walking, biking and transit. So what would be a better framework? A better approach would supplement Alternative 4 by ensuring every part of the city is within walking distance of an urban village. Everyone should have a neighborhood business district they can walk to–a dense, mixed-use place with street life, stores, and restaurants. Every part of the city should be within walking distance of low cost housing types like rowhouses and small apartment buildings to foster economic diversity. Every part of the city should be within walking distance of a neighborhood business district with jobs so at least some people can walk to work. Every part of the city should be within walking distance of a growing neighborhood center that can support great transit service. Adding urban villages in these new areas relieves pressure on the working class urban villages, makes our wealthy neighborhoods more accessible, and provides the environmental benefits of more walkable, transit supportive communities. This approach is essentially the Urban Village strategy Seattle created in 1994. Most of the city is within walking distance of an urban village—we just left out a few places. Now let’s add them back in. Welcome to Alternative 5 (trumpets play). What were the most egregious omissions in 1994? That would be almost all of Northeast Seattle, along with Magnolia and Madison Park. The graphic below shows the ½ mile walksheds—as the crow flies—for the existing urban villages alongside the displacement index map from the City’s equity analysis. 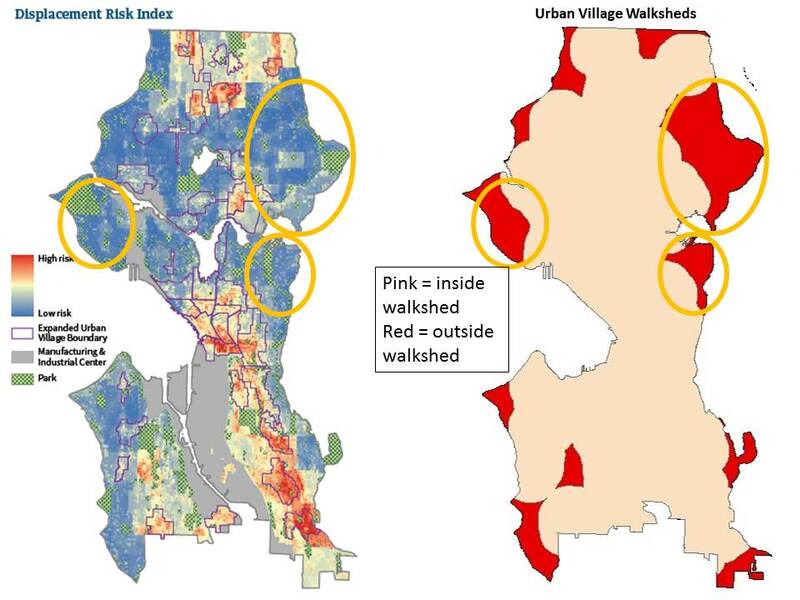 These three areas circled in orange—Northeast Seattle, Magnolia, and Madison Park—pop out on both maps as being outside the urban village walksheds and having very low displacement risk. Displacement Index compared to proposed Urban Village walksheds (click for larger version). 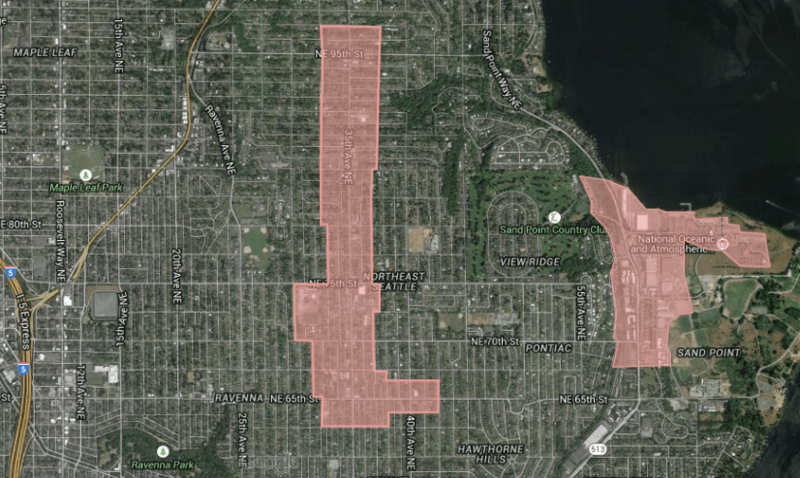 There are a few other areas in red on the periphery of the city (and Delridge), but these three areas stand out for their size and proximity to downtown. Magnolia and Madison Park would appear larger on a more precise walkshed map because they are separated from the nearest urban villages by steep hills, bodies of water, train tracks (for Magnolia), and gated communities (for Madison Park). All three areas are significantly wealthier and whiter than the city as a whole and generally have less diversity in housing types (except Madison Park) as shown in the table below. Let’s start with Northeast Seattle, the biggest of the three areas, spanning the neighborhoods of Bryant, Wedgwood, Laurelhurst, Windermere, View Ridge, and Sand Point. From the University District to Lake City, there are no urban villages to the east. As shown above, these neighborhoods together are home to over 36,000 people. It’s an exclusive area with median household income at $100,129 (compared to $65,277 citywide) and a racial make up of 80% white (compared to 67% citywide). About 20% of the households make over $200,000 a year, and in Laurelhurst, that number rises to 34%. Explaining this disparity (and thanks to the lack of an urban village) single-family, detached homes make up 76% of the housing units compared to 45% citywide. Despite the low densities and lack of frequent transit service, only 58% of residents drive alone to work compared to 52% for city as a whole. This indicates that the biggest alternative transportation challenge is for trips like shopping and meeting up with friends, the kind of trips that could be helped more by a better neighborhood business district than by increased transit service. Is there a good place to locate an urban village in Northeast Seattle? Yes! Two good candidates stand out. The most obvious is 35th Ave NE from about NE 65th St to NE 95th St (right by my childhood elementary school). While this central strip through Wedgwood remains very auto-oriented, it has good street grid bones and a host of destinations from the northeast library, to major grocery stores, houses of worship, and a smattering of other shops and places to eat mixed in with trees, surface parking lots, and tiny houses. Eckstein Middle School is right there, too. 35th Ave NE and NE 65th St may even soon become a high frequency transit node as part of Metro’s University Link restructure. Such a long, skinny Urban Village would not be unprecedented. The Phinney Ridge-Greenwood Urban Village similarly follows Phinney and Greenwood Avenues from 65th to 90th Streets. Top: Some businesses on 35th Ave NE are trying to take a more pedestrian-oriented approach. Bottom: Most businesses still sit behind a row of off-street surface parking. One-story new construction, like the building below, is a missed opportunity. New zoning would allow for taller mixed-use development. A produce vendor takes advantage of a large, unused surface parking lot. In the winter, you can buy a Christmas tree here. The Wedgwood Urban Village described above is a start, but providing good coverage for all of Northeast Seattle requires a second urban village further east. The area around Magnuson Park is probably the best candidate. The former military buildings on the north end of the park have been repurposed bringing employment and a variety of facilities and services including almost 500,000 square feet of office space for the National Oceanic and Atmospheric Administration’s Western Regional Center. Low-income housing has also been built there and more is coming bringing a low-car ownership population to the area. However, there are almost no stores for these workers and low-income residents to walk to. Each sector feels isolated and not part of an urban fabric. 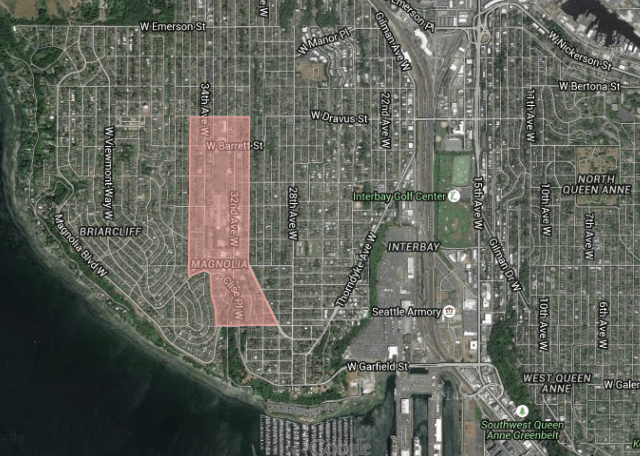 Urban village designation could be the beginning of a strategy to knit Magnuson Park with the neighborhood on the other side of Sand Point Way and add more neighborhood serving retail. Left: The beginning of a sidewalk at one of the only retail establishments in Sand Point. Right: Large facilities from the Sand Point Naval base now housing recreation activities and major employers like NOAA and the University of Washington. New Wedgwood and Sand Point Urban Villages in pink. Magnolia is actually closer to Downtown Seattle than the West Seattle Junction and could have a similar type of urban village. However, it is currently one of the most isolated and exclusive neighborhoods in the city. As noted in the table above, over 12,000 people currently live in Magnolia. 88% of them are white and the median household income reaches $112,301; 24% percent of households make over $200,000 per year. The housing make up of Magnolia is 84% single-family detached units. The southern half of the peninsula boasts even more extreme demographics with a median household income of $147,765, a 99.6% housing share of single-family detached units, and a racial breakdown of 90% white. Meanwhile, 60% of employed residents report that they drive alone to work. As with Northeast Seattle, this rate is not much higher than the city average. Magnolia has almost no retail or basic services. Building up a neighborhood business district would be a long-term project. Despite its limited stature, the area around the Magnolia Community Center is the obvious location for a new urban village. Located in the geographic center of the neighborhood, these few blocks also contain two schools, a playfield, library, a smattering of multi-family housing, and a cluster of stores and restaurants around W McGraw St and 32nd Ave W.
New Magnolia Urban Village in pink. The final urban village addition would be Madison Park. This neighborhood is in many ways a mirror image of Magnolia. 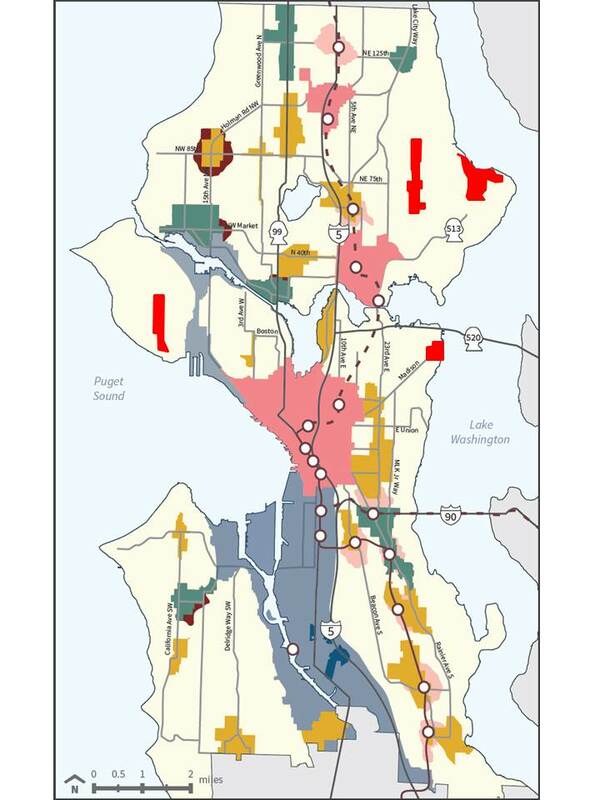 Fronting on Lake Washington instead of the Puget Sound, close to Downtown but isolated, incredibly wealthy (median household income $106,908) and white (87%), Madison Park is home to Seattle’s only consistently Republican-voting electoral precinct (the gated community of Broadmoor). The one main difference is housing types. Madison Park is home to two large residential towers of the Park Shore Retirement Community, which knock its single-family detached housing percentage down to 47%, although these retirees do not show up in the commute data, 65% of employed residents drive to work alone. These residential towers, and the cluster of stores next to them, could lay the foundation for the final urban village addition. The Seattle Department of Transportation is currently looking at a new bus rapid transit line on Madison St, but Madison Park itself does not have the ridership to support extending the line all the way to the lake today. A new urban village here could eventually change that dynamic allowing for a future extension of the line. New Madison Park Urban Village in pink. Adding Wedgwood, Sand Point, Magnolia and Madison Park as Urban Villages helps these neighborhoods become more urban, walkable, economically diverse places. However, I want to emphasize again that the equity impacts are broader. As the original 1994 Urban Villages start to fill up, adding wealthy parts of the city to the urban village mix helps take pressure off the working class neighborhoods in the Rainier Valley and elsewhere already under consideration for expansion. Alternative 5’s broader set of urban villages can be part of a comprehensive arsenal of mitigation strategies (discussed in Part 1 and in the City’s equity analysis) that can make growth in working class neighborhoods more equitable. Alternative 5 Map with additional Urban Villages approximated in bright red. Why would we not want to add these urban villages? Why were they not included in previous alternatives? Discarding the notion that exclusive enclaves should remain exclusive to retain their neighborhood character, I think the main objection to Alternative 5 rests on fear that these neighborhoods have inadequate infrastructure—mainly in the form of transportation. Seattle has a fear of adding density before adding transit, which is ultimately a fear of traffic. We have horrible traffic and no one wants to make it worse. Won’t adding density before adding transit make traffic worse? Isn’t that how we got ourselves into this traffic mess in the first place? A traditional level of service traffic analysis will certainly tell you that adding more density will make traffic worse, but level of service analyses are shown to be highly inaccurate in urban settings and are starting to be rejected as a methodology for measuring development impacts. If you recall the density-vehicle miles traveled charts from Part 1, vehicle miles traveled per capita goes down as density goes up. Beyond that, there are three reasons why I think the traffic impacts will not be that bad. First, Seattle suffers from what Eric Eidlin calls dense sprawl. Like Los Angeles, much of our region is too dense for free flowing car traffic, but has a dearth of places dense enough to support transit, walking, biking, and proximate trips. Making the transition from dense sprawl to urban neighborhoods is what the Urban Village strategy is all about. The suburban retrofit is another way to talk about this transition. Third, this is a gradual process. Imagine in a couple of years that NE 35th Ave gets a few new apartment buildings with ground floor retail. Is the traffic bad yet? It gets a few more and a small office building to boot. How about now? Is the traffic really bad now? Part of the whole goal of spreading development to more parts of the city is that every neighborhood gets a more gradual growth experience with more opportunity for adjustments and accommodations. There should be time to see traffic problems as they develop and address them before they become problematic. These neighborhoods do have some transit service already and that service can get gradually better as the neighborhood grows. For people that want a transit-oriented city there is a political factor to keep in mind as well. Providing the transit first assumes that the density will come afterwards. However, many our transit station areas have sat without development for years, partly because of the recession, but mostly because zoning restrictions were not lifted. When you let the density happen first, you know it will be there to support the transit service that is eventually added. For people that want an equitable and inclusive city, it’s also important to keep the traffic problem in perspective. Is the risk of a few years of bad traffic in a few wealthy neighborhoods really an excuse for focusing development in ways that exacerbate our affordability crisis and displace poor people and people of color from our city? The Draft EIS states that “Single family homes … account for 84 percent of the residential structures, but supply only 45 percent of Seattle’s housing units.” (p 3.6-7) The current plan to shoehorn all growth into areas that have already exceeded their planning development according to the current 2015 Comprehensive Plan is unfair as there exists rooms and other arrangements in the single family homes that could be rented out. As all of Seattle will be absorbing incoming residents in the form of traffic delays and increased burdens on public utilities such as water, sewage, and power, the burden of absorbing the increase should be borne by all neighborhoods, too. In 2013, Alan During in Unlocking Home: Three Keys to Affordable Communities proposed three ways changes in local laws could expand housing supply. ✧ welcoming accessory dwellings such as granny flats and garden cottages. Yes, the Comp Plan draft envisions new residents wanting to live close to transit and thus avoid owning cars. Nice dream, but as data in the EIS itself shows, 85 percent or more of peak travel time trips are by single occupancy vehicles or carpools (figure 3.7-13). Those cars, trucks, and vans sit in parking spaces when not in use. There is much more curbside parking open for these vehicles in the residential neighborhoods that will absorb some of the growth when During’s suggestions are passed. 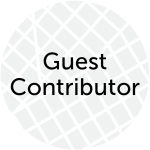 I am a Magnolia resident who believes this neighborhood is ideally suited to many of the concepts described here, close to the urban canter with a changing demographic becoming younger and more family-oriented. I am a supporter of transportation access, and social justice. I am not a NIMBY, and I think this is a discussion worth having, but having lived here with my family I think there are some significant practical/logistical problems that are not addressed or acknowledged here. A lot of things look good on paper, but I’m not sure the writer has really been on the ground here. I do not clearly understand where around the community center this density housing would be built? Certainly there are a couple of blocks along 32nd where that might make sense, but open property is the park and playfields, which are in constant use (scheduling for the community softball and soccer is a challenge). Is the proposal to buy out many dozens of homeowners and tear down their houses to build the townhouses? Where are you going to put kids in school? The schools are already at or over capacity (Catherine Blaine has portables). Will you re-open the old Magnolia school on 28th? There is also a chicken-and-egg problem with transportation. To attract the new residents we need more access capacity, but transportation into Magnolia center is getting reduced, even while options along 15th are increasing. For vehicles there are only 3 access points to/from Magnolia, which already create a choke point for vehicles, especially at Interbay (which is rapidly turning into an urban village in its own right) and Fisherman’s Terminal. The Magnolia Bridge is already an earthquake hazard. Unless access is improved, how will you attract the new urban, non-car owning demographic? Among the intangibles is the difficult-to-build sense of community. People here know each other. Our kids go to school together, play in the sports leagues together, and we see each other at the grocery store, at the many community events, etc. It is a quiet place, where the sidewalks roll up at 10, and people like it that way. I am skeptical that forcing a completely new character, creating an artificial “urban” center, onto a neighborhood is the right thing to do. Maybe that sounds snooty and insular, but this is not a neighborhood of urban hipsters, and trying to turn it into something it fundamentally is not will meet a lot of resistance. That being said, there is an obvious alternative. I think consideration should be given to the NE side of Magnolia, where the Magnolia Manor apartments are and is already the densest part of the neighborhood, but is nearly completely lacking in any kind of retail, restaurants, or services. It is also very isolated from the village by the hill and added distance. It gets more through traffic than the village since it is along the approach to Discovery Park, is close to Fisherman’s Terminal, the Ship Canal Bike Path, the Commodore Way industrial area, and is not “over the hill and far away” from 15th Ave . With improved connections to those areas it seems like a more natural place to look to create an accessible, vibrant urban village. Can I get an amen on form-based code rather than use-based? Dig it. I’d also be interested to hear ideas about how we might bring this sort of density to the portions of the south end that are east of Rainier (in which the displacement risk is low, as is the access to opportunity), though I understand why Magnolia, Madison Park, and NE were chosen. I’m a Seward Park resident — outside of the Columbia City and Othello walksheds — and a YIMBY, to be clear where I’m coming from. Great article. I totally agree with the summary of the options as they stand. Right now we are basically zoned to be manhattan or the hamptons. Of course workers cant find a place to live. We need some places like queens and brooklyn too. The only thing I would isn’t really about urban villages, but I wish Seattle would get rid of the 400ft limit in Belltown and the denny triangle. In 20 years our skyline is going to look like a wall. Let arcitects get creative. Another superb article — even better than the first (which is saying a lot). I have a few comments. First, I really like the Magnolia idea (along with the other ones) but Magnolia is not as far away from having a decent retail core as your comments suggest. The Magnolia Village area makes sense for an urban village because, well, it is a village, and it is in the city. There are a fair number of businesses in the area (restaurants, bars, grocery stores, hardware stores, etc.) and your area would include and expand on that. Trivia note: it is where Magnolia Hi-Fi actually started. Anyway, there are a few low rise buildings there (or mid rise, I don’t remember) so an expansion there would not be radical. There are really three sections to Magnolia: the east, which is fairly dense and getting denser; the middle, which includes the area you suggested as an urban village; and the west, which is nothing but single family homes (some modest, some spectacular). The area you’ve sketched out has great potential in part because it doesn’t touch the west and sits on flat land between two hills. This is one reason that Magnolia Village has been reasonably popular through the years — it is easy to walk around (as it is one of the few flat areas of the city). It is also at the bottom of the hill, which means that as people build up, you really aren’t blocking anyone’s views. 34th especially seems like a street that should have more apartments as well as retail. It is a “main drag” type of street, and if you travel there now, you are surprised that the street has nothing but houses and a church in the middle (towards the north there is a grocery store while the south is part of Magnolia Village). It reminds me of 8th NW — a street that seems inconsistent for Seattle, which has tried to funnel all of its apartments onto arterials. Which gets me to my next point. This is by far the best urban village suggestion out there, but I think the urban village idea is a failed experiment. We need growth everywhere, and focusing on only a handful of areas and saying it will occur here (and only here) is a bad idea. I think it only leads to higher rents. I’m not suggesting we abandon all zoning, but rather, a few things. First, liberalize our ADU laws. Likewise, liberalize the low rise zones to allow the same heights (or even lower heights), but with more people (by getting rid of FAR limits, parking requirements, etc.). These two steps alone would go far in spreading density to more places, which ultimately will allow for cheaper rents and better public transportation. But as far as upzoning (or allowing more retail zoning) I would spread that as far as possible. By all means include the areas you mentioned, but include many more. Along with the village concept (a big section) look at a broader upzone throughout the city. At a minimum, I would like to see every arterial allow retail as well as low rise. I think this should be extended to the other side of the block as well. This is far less disruptive, and I think will be much easier to approve than some of these other changes. I think there is need for more “village” type areas (that are less linear) but the first thing I would do is approve that. The combination (much denser single family zones along with more wide spread low and mid rise zones) would lead to a lot more affordable housing and a lot better city, in my opinion. Which is not to say that these suggestions should not occur at the same time. I have nothing against these changes — I think they are great. I just don’t want to leave the impression, as we have in the past, that it is adequate. There are areas throughout the city that are simply zoned too low; areas that are nowhere near an urban village (or a proposed one). At the same time, we really need to change the rules that apply to a zoning type, and not just worry about whether one area is zoned high enough. So I fully support these changes — you’ve done an excellent job — but we can’t rest if these changes are implemented, there is a lot of work to be done to reform our laws, as well as the areas where they apply. I live in magnolia and always wondered why we don’t have an “urban village”. We have a shopping district along McGraw (with great restaurants and nail places, so no car needed) that many neighbors would gladly see expand. A new apartment building in the “Village” is planned; we have lovely new (expensive) town homes. I welcome more income diversity and housing types, especially ADU/DADUs. On my block, we have more than 10 different ethnic groups represented, many techies new to the area. Come visit. You’ll be surprised by what you find. I’d been under the impression that Wedgewood was an urban village. As a matter of policy, this is a no brainer. On the politics, it’s probably a non-starter in Magnolia. The NE Seattle portion of it might have a fighting chance; I don’t now. I hope so. I wouldn’t be so sure about Magnolia. The areas he picked (as I explain above) has probably the best chance. Not that it is the densest part of Magnolia (not even close) but it is flat, and sits in between two hills. This makes it great for walking around, and it means that new buildings won’t interfere with views very much. It is also where Magnolia Village currently exists, so basically this is just an expansion, not a brand new, radical change. This series is a smart and important contribution to the discussion about Seattle 2035. First: thank you. Second: it can’t be emphasized enough that single-family detached homes and high-rises are the most expensive urban housing forms. As pointed out, focusing on short-term spot displacement from Alternative Four versus grand scale long-term displacement from Alternative Two is missing the forest for the trees. Finally and most important – kudos on articulating another alternative. It is telling and a bit sad (I say as a Seattle resident) that all the initial four alternatives all assume that some affluent, white, single-family on large-lot dominated neighborhoods remain frozen in amber for all time. This alternative is an fantastic idea. It does not, however, address a critical point: Implementing such a plan. Politically, the neighborhoods discussed have more money and time to spend fighting changes coming their way, inevitably slowing down or even stopping the changes from happening, which could by they weren’t considered in the first place. While I agree with the assertion that these neighborhoods should be considered to get new development, I also agree with the assertion that we should all get free ice cream every Friday afternoon. I could make a great argument for free ice cream but it doesn’t help us get a refreshing treat at the end of each week. More than demographic data and transportation analyses, implementing this plan would require enormous care and intentionality to assure each neighborhood that looming changes would not tarnish the character of each place. Simply proclaiming that “these changes will enhance the community and city as a whole” is not going to do it. Should this alternative get some traction (and I hope it does) I would be very curious to see one or each neighborhood mentioned pursue form-based code as a way to both ensure new development and assure residents that the charm and character that they know and adore won’t be tainted by plain, uninspired blocks of new buildings. Good luck and keep up the good work!